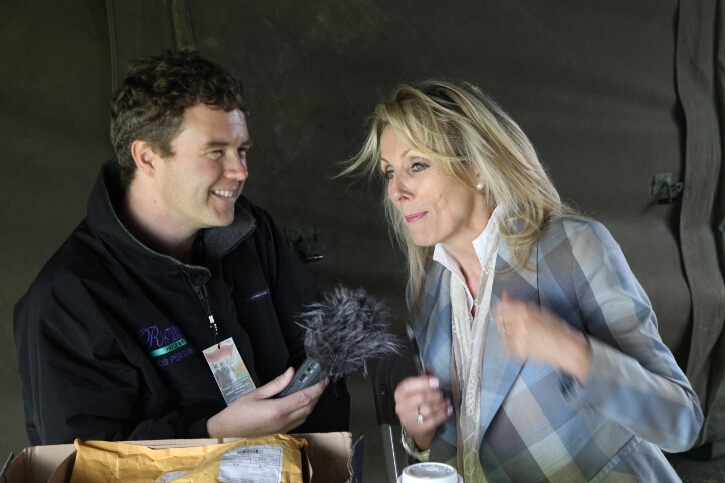 Compère Anne Davies chats to Rob Persani of Rutland Radio. Our compère for the day was Anne Davies of BBC East Midlands. During the day, the main stage saw performances by three groups – the Band of the Royal Electrical and Mechanical Engineers at 11am and 2pm, the Rutland Concert Band at 12noon and 4pm, and the Rutland Sinfonia at 1pm and 3pm. Then, at 5pm, the Prize Draw took place, followed by a March Past by Oakham School CCF Cadets, with the salute being taken by Lord Lieutenant of Rutland, Dr Laurence Howard OBE. The Rutland Primary Schools’ Choir and Rutland Voices then assembled for the world premier of Wildflower Meadows. They shall not grow old from ‘For the fallen’ by Laurence Binyon, was read by the Station Commandant, Lieutenant Colonel Steve Lonnen MBE, followed by The Last Post and two minutes’ silence.